On 16 July 1799 in London Hugh Rose married Arabella Phipps. Hugh made a fortune in the Government Commissariat service in the West Indies, in the Caribbean. Hugh acquired a share in plantation Geanies in Berbice in 1801, along with J Crawford Macleod of Geanies and John Bethune, the son of another Ross-shire minister. Returning to Scotland about 1802 the couple came to Ross-shire where Hugh bought Glastullich, Calrossie and Tarlogie, as well as Bayfield in Nigg, which they made their main home. He named the area known as ‘Arabella’ in Logie Easter after his new wife Arabella. In 1796 Hugh Rose had purchased the land and buildings which are now known as Arabella. At the time the land which lay between Glastolloch and the Cromarty firth was low lying and liable to flooding in winter. It contained a 17th century croft house called Drummeddat which was part of the Shandwick Estate. Over a number of years Hugh extended and developed Drummeddat croft to create a substantial Manor House and farm which he renamed after wife Arabella. The development was undertaken in a number of stages and was unlikely to have been completed before Arabella’s death. Arabella died suddenly in mysterious circumstances on 9th November 1806 “in the act of preparing medicine for a sick and indigent family”. It is rumoured she was murdered by her husband’s mixed-race ‘mistress’ who had been brought back to Bayfield from his plantation in Berbice in the Caribbean. Hugh Rose, through his second marriage to Catharine Munro, acquired the estate of Cromarty and changed his name to Hugh Rose Ross. In 1829 he still owned plantation Experiment on the east side of the Berbice river, which he renounced in favour of the government [Foreign Office Library, Land Claims]. Experiment had been owned by Roderick Rose & Co in 1798 – possibly an unidentified relation. Hugh Munro-St Vincent: born – 28 May 1800 died: 11 April 1867, Croyden, England. Married 22 October 1836, Frances Walrond Roberts. Rebecca: born – 1802(?) Married cousin Thomas Phipps Esq. Mary: born 1804 – died 1854, St Ernans House, Ireland. Married 1823 John Hamilton Esq. Copyright Â© 2007-2016 by Hamilton Family History. All rights reserved. Arabella Phipps could trace her ancestry through her father, Isaac Phipps, via his mother Esther Raboteau, to 14th century France. She was born to Colonel Isaac Phipps, who had been paymaster General in the West Indies, and Rebecca Dodd in 1766. On 16 July 1799 in London she married Hugh Rose, whose father had been parish minister at Tain. Hugh Rose and his brother both became wealthy in the West Indies, Hugh for a time working for her father Isaac. Arabella lived at the couple’s Bayfield House near the village of Nigg in Scotland for seven years where she bore four children; Hugh Munro-St Vincent, Isaac (died in infancy), Rebecca and Mary. In 1796 Hugh Rose purchased the land and buildings now known as Arabella. At the time the land which lay between Glastolloch and the Cromarty firth was low lying and liable to flooding in winter. It contained a 17th century croft house called Drummeddat which was part of the Shandwick Estate. Over a number of years Hugh extended and developed Drummeddat croft to create a substantial Manor House and farm which he renamed after wife Arabella. The development was undertaken in a number of stages and was unlikely to have been completed before Arabella’s death. Married: 16 July 1799, London, England. Died: 9th November 1806, Bayfield House, Nigg, Scotland. Isaac Phipps, Colonel: born? – died? Rebecca Dodd: born? – died? Hugh Rose (Ross) was born in 1767, son of the parish minister of Creich and later Tain. Hugh and his brother William Baillie Rose were the two sons of the Rev Hugh Rose, parish minister of Creich (1759-70) and of Tain (1770-74). By 1794 Hugh was fulfilling the duties of deputy paymaster general for the West Indies, having been appointed to this position by the holder of the office, a Mr Phipps. Concern about the excessive cost of stores in the West Indies led to the establishment of a parliamentary commission and to the trial in 1809 of Valentine Jones, Commissary of Stores, on charges of corruption. Hugh Rose was in effect the go-between in dubious transactions involving Jones and a merchant Matthew Higgins. Higgins also used a trading house (consisting of his own brother, his clerk’s brother, and Hugh Rose’s brother William Baillie Rose) to take excessive profits, sometimes receipted under false names. Rose was not called on to give evidence. He made a fortune in the Government commissariat service in the West Indies, returning to Scotland about 1802. He came to Ross-shire and bought Glastullich, Calrossie and Tarlogie, as well as Bayfield in Nigg. In 1799 Hugh Rose married Arabella Phipps, the daughter of Col. Isaac Phipps of Manchester Square in London, who had been paymaster general in the West Indies. Their children were a son Hugh Munro-St Vincent born in 1800, a second son Isaac followed who died in infancy, Rebecca in 1802 and Mary born in 1804. Hugh acquired a share in plantation Geanies in Berbice in 1801, along with J Crawford Macleod of Geanies and John Bethune, the son of another Ross-shire minister. He became addicted to legal actions and took forty years proving that the only son of George Ross of Cromarty, the former army agent, was illegitimate so that he, Hugh Rose (before he added “Ross” to his surname), might claim the estate through his second wife, Catherine Ross Munro, heiress of entail to the estates of Culcairn and Cromarty. It was then that he added the name of Ross to his own, styling himself Rose Ross till his death in 1846. Strangely enough, he had an earlier indirect connection with part of the property he ultimately acquired. At the end of the 17th century, a family of Reochs were tenants of Castlecraig, one of them, William, being a great-grand-uncle of Hugh Rose Ross. 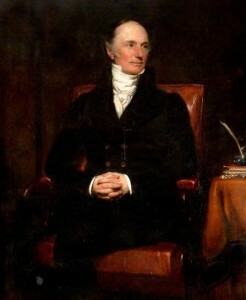 As the owner of extensive properties in Easter Ross (including Bayfield, Phippsfield and Calrossie), Hugh funded on supplying the British Fleet in the West Indies. The Rosses built the lodge and west drive, enclosed the park south-west of the house with shelter belts, laid out a rose garden and introduced ornamental planting throughout the policies. Hugh Rose Ross was known as an enthusiastic agricultural improver, responsible for modernising his properties. He oversaw the management of the policy woods, informal planting and the construction of footpaths on Gallow Hill and the headland. Further planting was done by George W. H. Ross in the late 19th century. Despite the estate’s high capital value, it was still encumbered by debt. Brigadier-General Sir Walter Charteris Ross (d.1928) sold some tenanted farms to reduce the continuing debt. By 1964, his son, Colonel ‘Geordie’ Ross, decided to sell the estate to the Nightingale family, retiring to a house built within the Walled Garden. The estate remains in private ownership. Hugh’s wife Arabella ‘in the act of preparing Medicine for the relief of a sick and indigent Family, suddenly expired on the 9th November 1806, aged 27 years’. According to a local legend she was, in fact, murdered by Hugh’s quadroon mistress, who has been brought back from the Caribbean to their home at Bayfield House, Nigg. Hugh Rose, through his second marriage to Catharine Munro, acquired the estate of Cromarty and changed his name to Hugh Rose Ross. Hugh Rose (Ross) born: 31 October 1767; married: 16 July 1799; died: 30 September 1846. [S2175] Ancestry Public Member Trees, Ancestry.com.au, (Ancestry.com Operations, Inc.), Higgins Family Tree Owner: higgins_philip2006 (Reliability: 3). [S1595] Stirnet Genealogy, Peter Barns-Graham, Rose02 (Reliability: 3). 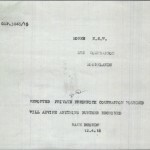 Frederick Hamilton Courbarron, the youngest of the four Courbarron siblings, enlisted in the A.I.F on 24th July 1917. At his enlistment he gave his occupation as farm hand and his address as a property named ‘Moorelands’ near Moree, NSW.Â Unlike his brother James, Fred nominated his mother as his next-of-kin naming her ‘Mary Courbarron’ and living at the same address in Moree. 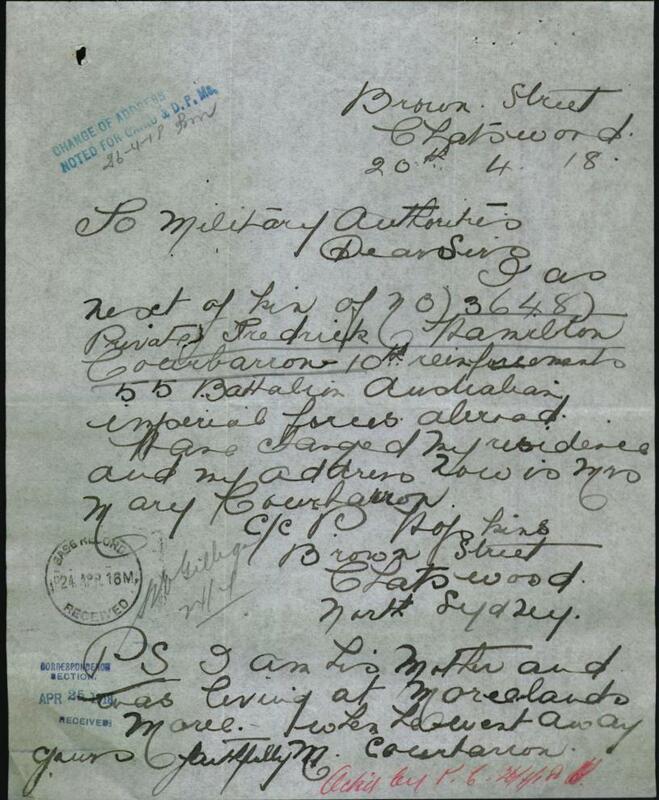 In 1915, Mary had written to Base Records in Melbourne regarding James from her address in Cuthbert Street (written then as ‘Cuthbirt’) in Waverley Sydney and signed her name as Mrs Mary ‘Casey’. By 1917 she was living at Moree and had reverted to her original married surname of Courbarron, she was living at this address when Fred travelled to Sydney to enlist. 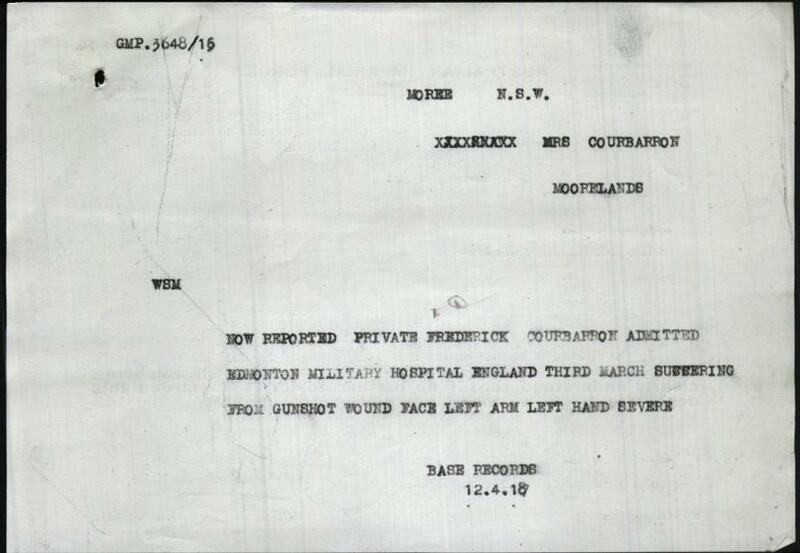 The first telegrams, dated 12 April 1918, sent to Mary were from Base Records to inform her of Fred being wounded. 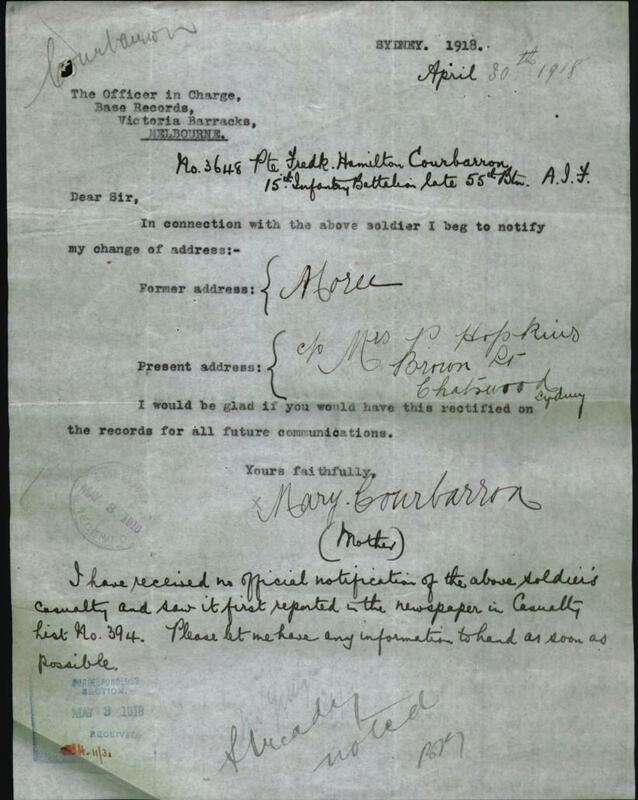 This was the first of a series of telegrams sent to Mary via Moorelands at Moree that were not received by her. a second telegram was sent the same day…Frederick had been wounded at Jura, which was part of the Western Front, in France…. “Moree N.S.W Mrs Courbarron, Moorelands. Now reported Private Frederick Courbarron admitted Edmonton Military Hospital third March suffering gunshot wound face left arm left hand severe. Base Records 12.4.18“. 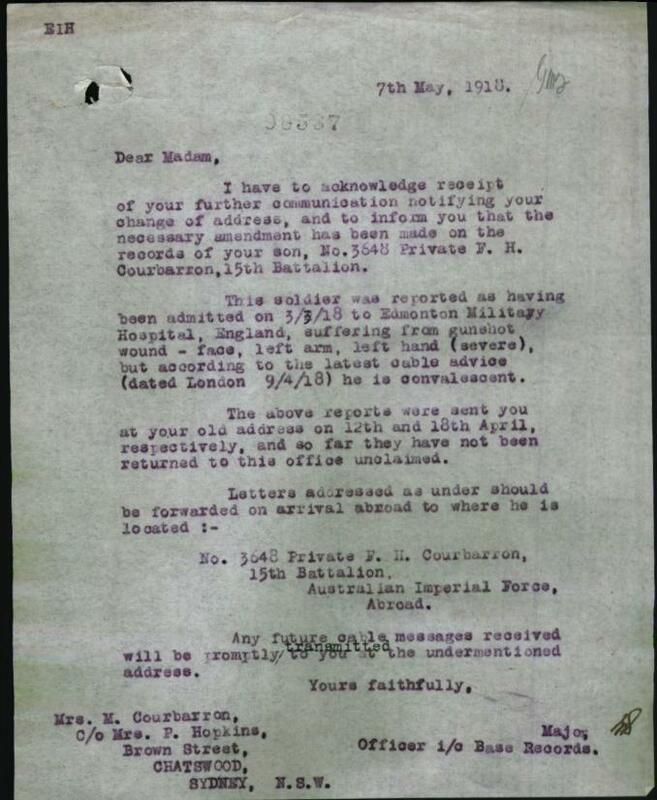 On the 18th April 1918, Fred was recovering in hospital in England when this letter from Base Records was sent to Mary informing her of his location. 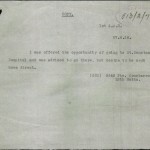 This letter, too, did not reach her as she was no longer living at Moree. “Melbourne 18th April 1918. Dear Madam, I now beg to advise you that Pte. F. H. Courbarron has been reported convalescent. His postal address will be: No.3648 Pte. 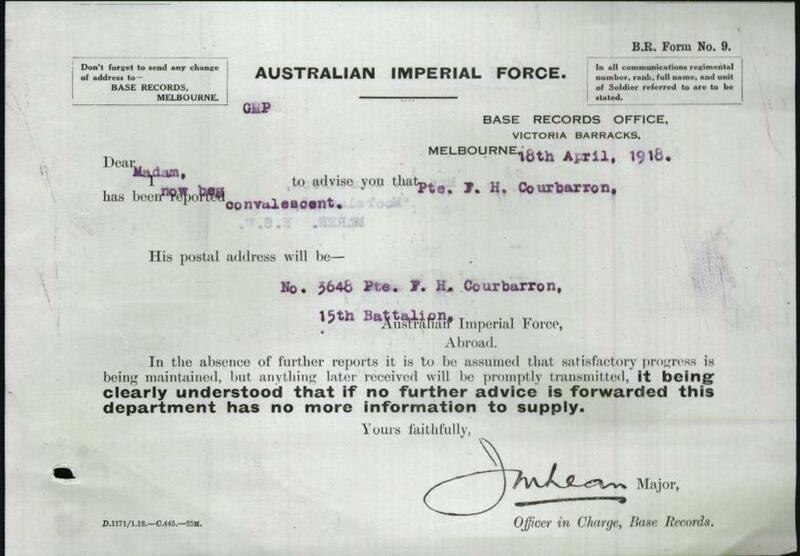 F. H. Courbarron 15th Battalion , Australian Imperial Force,Â Abroad. In the absence of further reports it is the be assumed that satisfactory progress is being maintained, but anything later received will be promptly transmitted, it being clearly understood that if no further advice is forwarded this department has no more information to supply. Yours faithfully J. M. Lean Major, Officer in charge, Base Records”. The Captain J. Lean who sent telegrams about James has by now been promoted to Major. 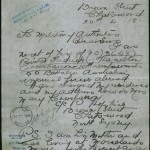 On the 20th April 1918, Mary writes a letter to Base Records informing the army, finally, that she has changed address from Moree to Chatswood and is now residing with her eldest child, Mildred Hopkins who was, of course, the n.o.k of brother James.Â Mary was to remain living with Mildred until her death in 1927. “Brown Street Chatswood, 20th 4. 18. To Military Authorities, Dear Sirs, I as next of kin of No. 3648 Private Frederick Hamilton Courbarron, 10th reinforcements 55 Battalion, Australian Imperial Forces Abroad, have changed my residence and my address now is Mrs Mary Courbarron c/o P.Hopkins Browns Street, Chatswood North Sydney. PS. I am his mother and was living at Moorelands Moree when he went away. Yours faithfully M. Courbarron”. On April 30th 1918, Mary filed an official change-of-address in Sydney which gave her contact as c/o Mrs P. Hopkins, her daughter. 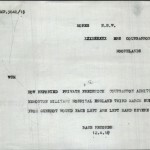 At the bottom of the form, Mary had written a message stating what she had seen regarding Fred in the Herald, the same way she had learned about James’ being wounded two years prior. 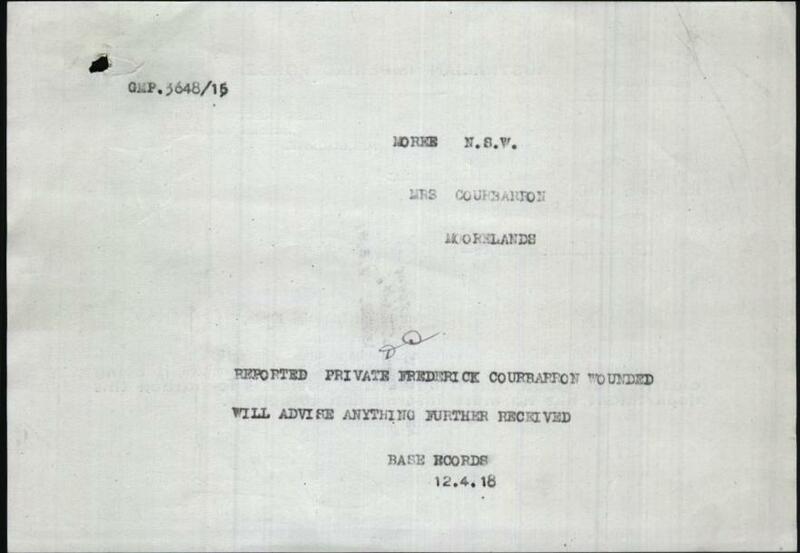 All previous notifications to her had gone uncollected at Moree, so she was unaware of Fred being injured in France, which had prompted her to lodge a more formal change of address notice: “I have received no official notification of the above soldier’s casualty and saw it first reported in the newspaper in Casualty List No.394. Please let me have any information to had as soon as possible”. 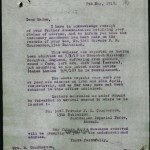 This letter was sent to Mary on 7th May 1918 bring her up to date on Fred’s condition: “7th May, 1918. 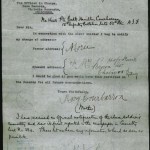 Dear Madam, I have to acknowledge receipt of your further communication notifying your change of address, and to inform you that the necessary amendment has been made on the records of your son, No.3648 Private F. H. Courbarron, 15th Battalion. This soldier was reported as having been admitted on 3/3/18 to Edmonton Military Hospital, England, suffering from gunshot wound – face, left arm, left hand (severe), but according to the latest cable advice (dated London 9/4/18) he is convalescent. The above reports were sent you at your old address on 12th and 18th April, respectively, and so far they have not been returned to this office unclaimed. 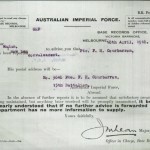 Letters addressed as under should be forwarded on arrival abroad to where he is located:- No.3648 Private F. H. Courbarron, 15th Battalion, Australian Imperial Force, Abroad”. 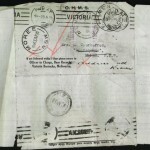 Copy of envelope addressed to Mary at Moree that was stamped ‘Address Unknown’. In March 1918, Fred had received serious injuries to his face for which he was offered a period of rehabilitation and retraining at the famed St Dunstan’s Blinded Soldiers and Sailors Hospital. This gives some idea as to his injuries at the time which clearly indicates he took some damage to his eyes. Fred however refused the option of spending time as St Dunstan’s and instead opted to return to Australia, he was 18 at the time. 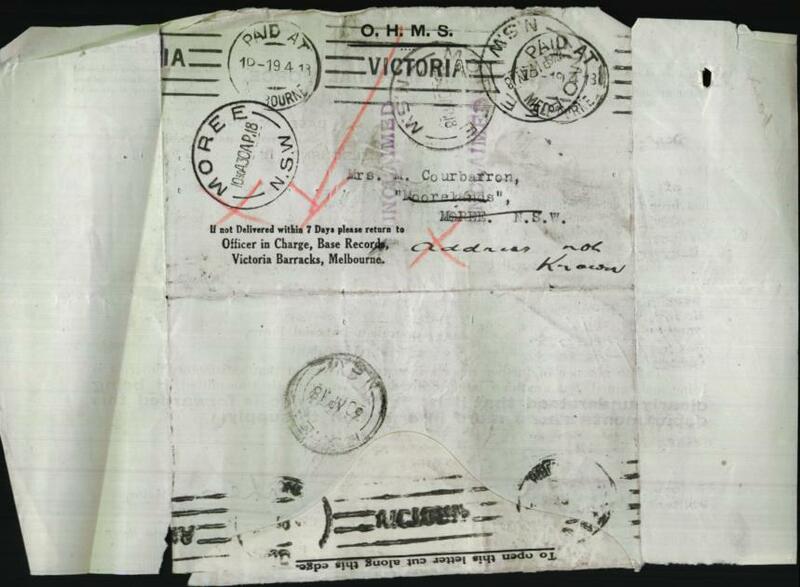 ThisÂ letter from June 1918 details his express wishes to be returned to Australia: “1st A.A.H 27.6.18. 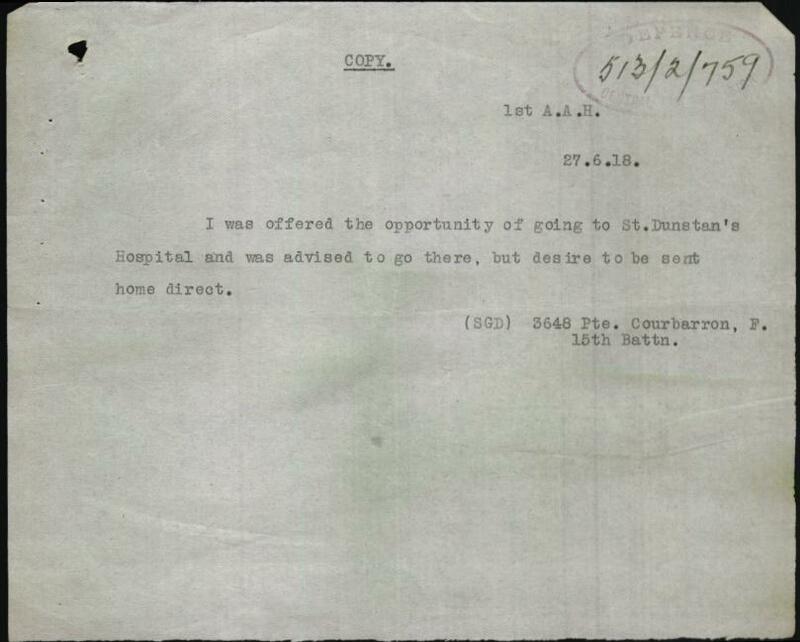 I was offered the opportunity of going to St. Dunstan’s Hospital and was advised to go there, but desire to be sent home direct. (SGD) 3648 Pte. Courbarron, F. 15th Battalion”. Frederick arrived in Sydney on the 4th September 1918, it can be assumed he either lived for a while on his return with his mother at sister Mildred’s house at Chatswood or he returned to Moree and his job as a farm labourer. He remained in the northern region of NSW for the rest of his life and married Mary Navin at Brunswick Heads in 1937. They had no children. Mary died in 1963, Fred died in 1983 andÂ both are buried at Brunswick Heads.